On October 27th, 2012, Devin Townsend performed a spectacular one-off show at the Roundhouse Theatre in London, UK. Featuring an extensive special effects budget and guest appearances by collaborators Steve Vai, Anneke van Giersbergen and Jed Simon, the show served as a retrospective, encompassing the last 20 years of Townsend's vast and varied career. In addition to the sheer scale and decadence of the show, it was a rare (and potentially final) opportunity to see Townsend perform songs from his most aggressive early project, Strapping Young Lad. Recorded both for video and audio, this unique live event has now become CD/DVD set The Retinal Circus (which, if you shell out for the deluxe edition, also includes a 40-page book, lithograph, and cardboard mask of Townsend's face, housed in a box that folds out into a diorama of the stage). 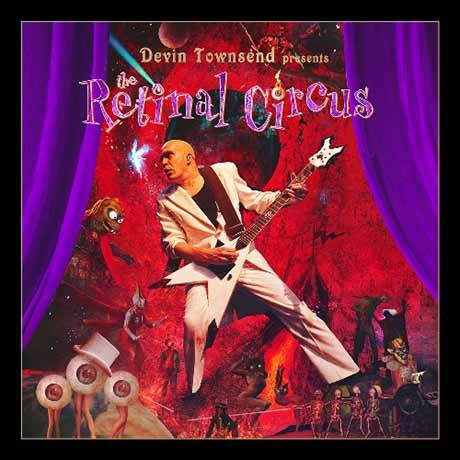 Townsend's studio albums have always effectively captured the vision and nuance of his talent as a producer and recording artist, but on The Retinal Circus we see his unparalleled command as a showman in all its glory. While unquestionably a wondrous piece of excess and extravagance, the live performance is also incredibly funny and self-deprecating, capturing the depth and breadth of Townsend's creativity as never before. The sound and video quality is exceptional, and lets the vivid, carnivalesque imagery shine through. There's a loose narrative woven throughout the performance of a young man wandering through the "collective unconscious," which allows the audience to explore Townsend's creative visions as if wandering through a kind of deranged wonderland. Heavy on material from recent release Epicloud, it's unquestionably the songs from his comedic interstellar musical, Ziltoid the Omniscient, that are the highlights of the performance, renewing interest in the possibility of a stage musical adaptation of this tale of a coffee-mad alien warlord.